Universal primary with taps for 100, 120, 220 or 240 VAC, 50/60 Hz. Designed for preamps, low power amps, general replacement, test equipment, etc. Economical, open frame, chassis mount - two hole (.187 dia. = G) channel bracket (figure #1) or four hole mounting (figure #2). Units include a Faraday shield between the primary and secondary windings. Our electrostatic shield reduces the capacitive coupling from the primary - greatly attenuating higher frequency current coupling to the secondaries. 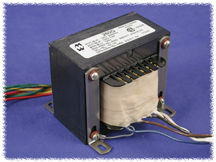 For more selection check out our "300" series of universal plate & filament transformers. 1) These units are designed to run with BOTH primary windings energized for maximum efficiency (see wiring table below). 2) The Faraday shield lead - the gray wire - marked SH (shield) above, should remain grounded to the mounting bracket & in turn to the chassis.